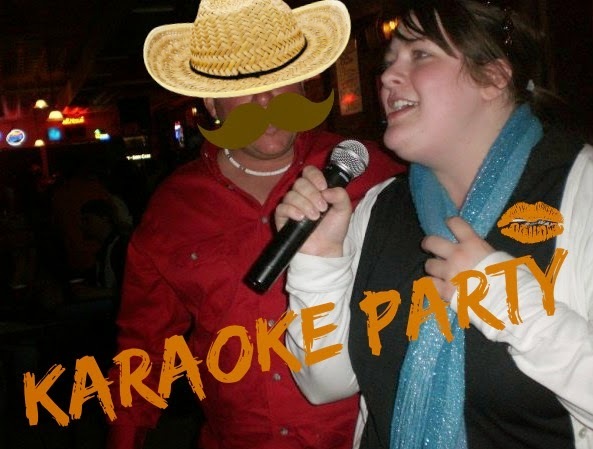 Let's hope we have even more fun than my first time going out to sing karaoke back in 2009. Let's hope my face never gets that chubby again. And while we're at it, let's hope no overly amorous Bachelor Party guys try to steal the stage. In Hard Hats and Doormats, Lexi Burke's favorite way to unwind involves hitting up a local dive bar to belt out a few songs during karaoke night. She has a song for every occasion. She sings Shania Twain's "No One Needs to Know," when she's feeling a bit angsty about her relationship status. She dreams about one day channeling her inner Ol Blue Eyes and singing "My Way" if she ever finds a way out of her job at Gulf America. She's even completely smitten when her crush sings "Amarillo by Morning" by George Strait. 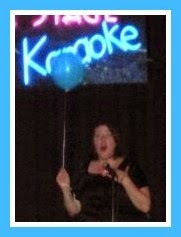 Grab a mic and balloon. It's been far too long since I went out with my friends for a night of karaoke. It's been ages since I sang "Like a Prayer" or any of my other favorites. And I figured it was high time to do something about that. Unfortunately, organizing an impromptu night of karaoke isn't as easy as it was when I was a carefree twenty-two-year-old. Fortunately, I have an amazing bunch of talented writer friends willing to have a virtual karaoke party with me. The best part: we can sing like no one is listening from the comfort of our own homes. And guess what? You're all invited! Now I need you to use your imaginations and pretend that Change the Word isn't a blog, but a dive bar. (For some of you, this might not be much of a stretch.) Can you picture it the sticky floors, dim lights and cheap pitchers of beer? Keep that in your mind, and imagine this post is a stage, or even just a patch of floor next to a DJ, probably named "Breezy Bud" or "Harmonious Harry." Because this was my crazy idea, I'll go first. I'm going to step out of my comfort zone of 80s classics and into this century. I'm singing a contemporary classic: "Telephone" by Lady Gaga, featuring Queen Bey. I even brought some sweet dance moves (and my rapping). Don't worry, my actual performance is only half as long as this video. I also kept my pants on. Next, please welcome my hilariously talented buddy Brea Brown. She's the author of Daydreamer, Let's Be Frank and a million other awesome books. She's keeping this party hopping with "Somebody to Love" by Queen. For our next number, I'd like to introduce SK Wills, author of Starting From Lost, which will be published this fall. She's also tackling "Here for the Party" by Gretchen Wilson, and she's up next. Put your hands together for my dear friend Cat Lavoie, author of Breaking the Rules and Zoey & the Moment of Zen. She's paying homage to Jersey Boys with "Can't Take My Eyes Off You" by Frankie Valli and the Four Seasons. Put your hands together for Nikki Mahood, who's work appears in Merry Chick Lit and A Kind of Mad Courage. She's performing her signature karaoke tune: "Torn" by Natalie Imbruglia. Let's bring Martha Reynolds to the stage. The author of Bits of Broken Glass and the Chocolate series is singing Barry Manilow's "Copacabana." Feel free to dance along at home. Make some noise for Samantha Stroh Bailey, the author of Finding Lucas and co-editor/contributor of A Kind of Mad Courage. She's doing a little "Got Me Wrong" by Alice in Chains. Woo wooooh. We have just enough time for one more song before last call. Brea and I sneak back up on stage to duet "Under Pressure" by Queen and David Bowie. Thanks for being such an awesome audience for us. You really were quite lovely. But, even though we're done with our set, the party isn't necessarily over. You're more than welcome to join us for another round. Oh, and before you leave, you can listen to the full playlist of songs mentioned in this Virtual Karaoke Party on Spotify! This was so much fun! Thanks for inviting me out to the bar with you and for letting me be Freddie Mercury for a few minutes. You rocked it as Bowie! Tonight i'll listen to the entire playlist! Oh no! I missed the party! Well, I would probably mutilate Ethel Merman's Everything's Coming Up Roses or other show tune. Great post! Great idea!!! This is so much fun! Thanks for inviting me, Laura! I'd do this in person anytime!